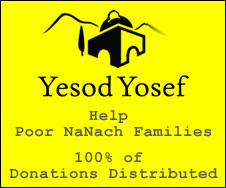 Na Nach Nachma Nachman Meuman: Yisroel Saba: The nations want Jerusalem? They will get earthquakes! Yisroel Saba: The nations want Jerusalem? They will get earthquakes! Previously there was discussion what brought on the earthquakes and huge disasters that the world just witnessed. Reading the conversations of Saba Yisroel it would seem that it could very well be God Almight showing the nations to be careful, often they take themselves too seriously thinking that they can determine what to do with the Jews and Israel, so H"Y gives them a little taste of his arsenal. Of course it is incumbent on us to also register our fear of God and repent, the main thing is to spread Na Nach Nachma Nachman MeUman! Check out the quote from Saba Yisroel on the Hebrew na-nach.net, and you can read the translation from nanach.org, Yisroel Saba page 118 (if it would let me, I would have copied the text here).